How many cadets are at PLA and what is the average class size? In the 2017-18 school year, PLA has approximately 53 cadets, grades 9-12. We are in our second year since establishing our Leadership Academy, and we currently plan to grow incrementally to 100 Cadets by the 2019-20 school year. How are special education students programmed in PLA? IEPs and 504 plans are developed by the Special Education Department in coordination with the parents/guardians. All cadets with an IEP or 504 plan are in classes with non-special education students. Select class periods also have a certified Special Education teachers co-teaching with the classroom teacher. Is PLA a part of the Minnesota Transitions Charter School (MTCS) and MTS Secondary? Yes. PLA follows all of the MTCS/MTS policies, procedures, and regular high school calendar. Funding is distributed from MDE to MTCS using the same formula for all Minnesota high schools. All PLA teachers as well as the JROTC instructors are members of the MTS faculty. PLA is connected to MTS Secondary. Do the PLA and MTS students intermix? Generally, no. Each school has its own autonomous section in which only their students can travel in. The only common areas are the cafeteria (of which PLA has its own lunch periods) and the gymnasium. A PLA cadet may encounter an MTS student on their way to one of the common areas. There are a few electives in which MTS Secondary students share with cadets. What are the freshmen classes? JROTC, and their choice of either Digital Music, PE or Art. What is a typical school day like? The day starts with Physical Training formation at 7:45- 8:30 am. Cadets then have from 8:30-9 am to change into their daily uniform and eat breakfast. Each cadet then has approximately seven 50 minute classes, and a 25 minute lunch. The academic day ends at 3:35 PM. Cadets are required to remain for an addition 55 minute extra-curricular activity session which can involve anything from preparing for a competition to, sports teams or academic enrichment. What is the PLA uniform? Four days a week, the cadets wear the school issued uniform of khaki slacks and black polo with sweatshirt optional. Typically on Wednesdays, the cadets wear the military uniform consisting of the Army Dress Blues all provided to the cadet and professionally fit at no charge. Cadets and parents are encouraged to get the uniform dry cleaned when needed. During the mornings from 7:45 – 8:30 am, all cadets wear the academy issued physical training uniform of shorts and t-shirt (sweats optional). Do I need to pay for the uniform? No. All of the required pieces of the Army Dress Blue uniform (to include shoes and socks) are issued free of charge to the cadet. Payment is only needed for damaged or lost uniform items. If a cadet grows out of a particular uniform item, they can exchange it for a different size. The school polo shirt, khaki slacks and physical training uniforms are also issued free of charge to the cadet. Cadets also receive 4 pair of khakis, 4 polos, PT shorts, t-shirt and sweats. Is there required military service after graduation? No. All cadets are prepared for and encouraged to attend a 4-year college or university or a trade school after graduation. If a cadet is interested in joining the military, what will PLA do? As PLA is a college-preparatory school, we would encourage the cadet to apply for a service academy (West Point, Annapolis, Air Force, Coast Guard, Merchant Marine) or a college ROTC scholarship. Both result in a college degree and a commission as an officer in the military.Those that are interested in the military have the opportunity to speak with military recruiters. The JROTC (Junior Reserve Officer Training Corps) program offers students in high school a comprehensive education in service and leadership, supported by the Department of Defense (Army, Navy, Marine Corps, Air Force). Our dedicated instructor team, comprised of retired military service members, offer students knowledge and skills that extend far beyond the classroom and prepare them for the diverse challenges of life. Through mentoring, extracurricular activities, and a rigorous academic program, the JROTC program instills confidence for young men and women, a sense of belonging and purpose, access to a range of non-classroom activities and leadership skills that help students reach their full potential. What does it mean for students who participate in JROTC? 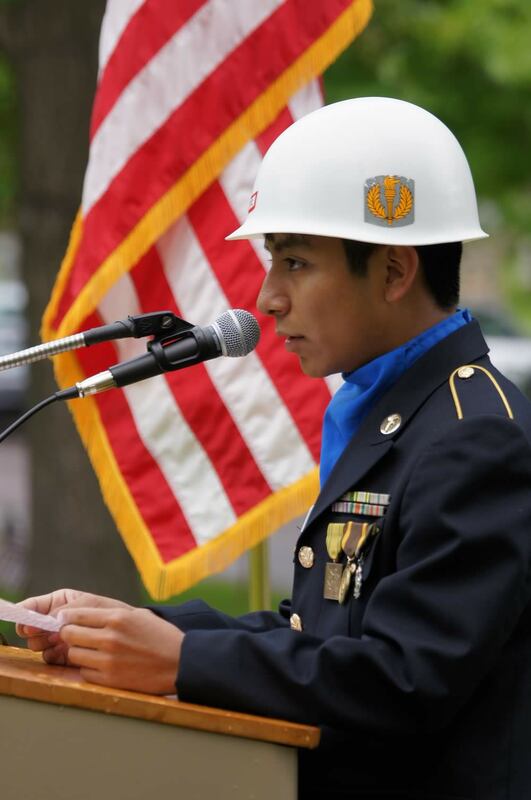 As a participant in JROTC, whom we refer to as cadets, students wear a military uniform that is provided to them one day a week (usually Wednesday). On every other day of the week they wear school uniforms of khakis and polo with optional sweatshirt all of which is provided to them at no charge. When in the gym doing physical training cadets where school issued shorts and t-shirt. Cadets have one period of classroom instruction, taught by one of the JROTC instructors. In the freshman and sophomore year, participation in JROTC serves to fulfill the Physical Education requirement. The curriculum taught during the Freshmen and Sophomore year covers a range of topics including civics education, financial literacy, communication and conflict resolution skills, leadership skills, service learning projects, and college and career planning. Outside of the classroom, cadets have access to a range of opportunities from orienteering, to drill meets, to sports competitions, debate and speech team, robotics,– you name it! Parents/guardians support the program by ensuring their students are prepared with the proper uniform on the appropriate day.